Advancing your education is a new and exciting adventure. It’s going to be different, but you have what it takes to succeed! 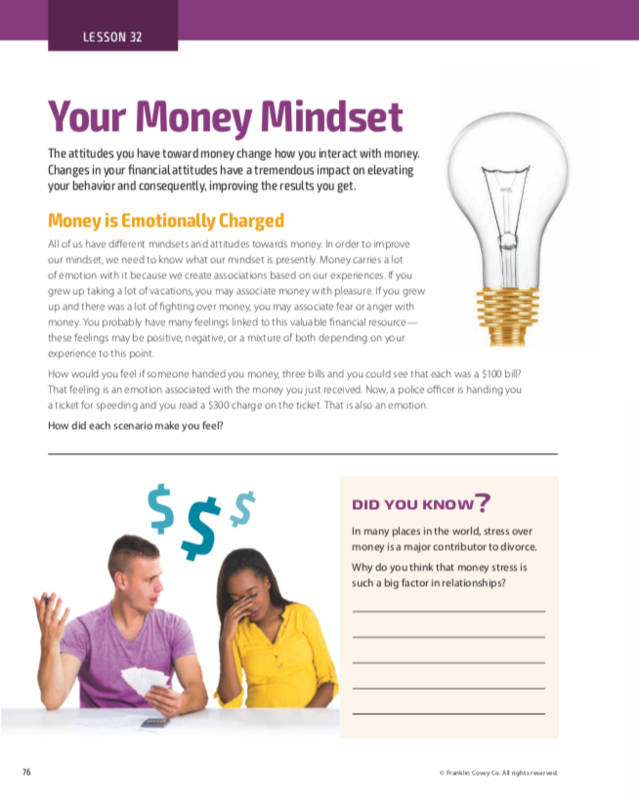 Develop academic, financial, and life-ready skills to be successful in college and beyond. 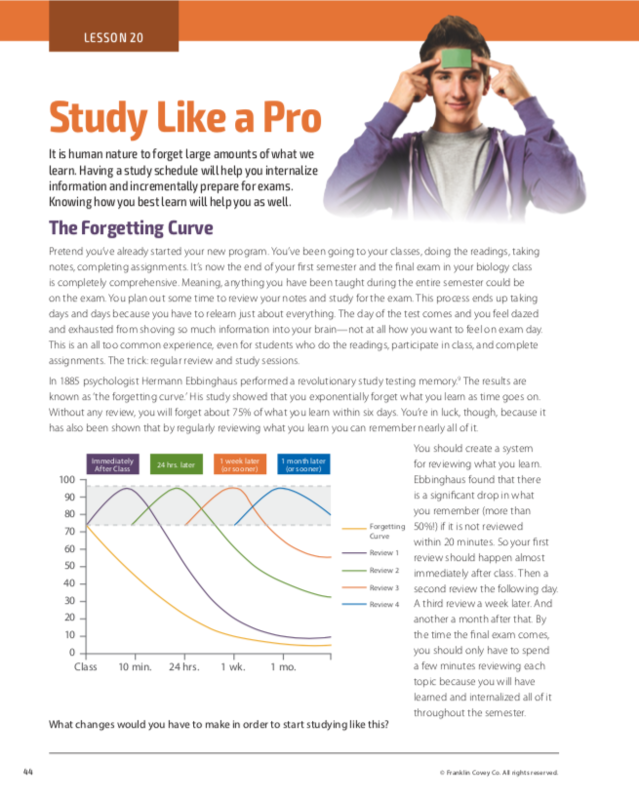 So you’ve decided you want to prepare yourself for collegiate success—or maybe you’re just thinking about it. That’s great! 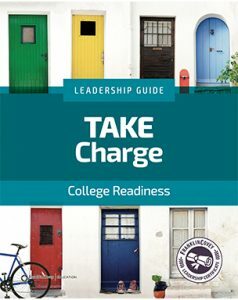 The Take Charge College Readiness course is designed to prepare you for the challenges and new responsibilities that post-secondary education brings to students like you. Right now, the best thing you can do is apply what you learn in this course right away. 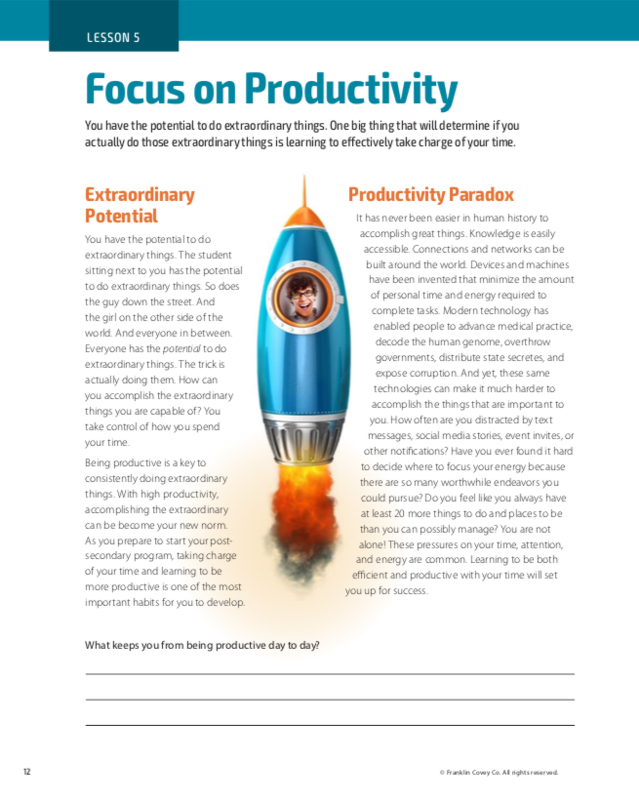 If you do, you won’t find yourself scrambling to develop important skills that make academic and general success possible skills—you’ll already have them. 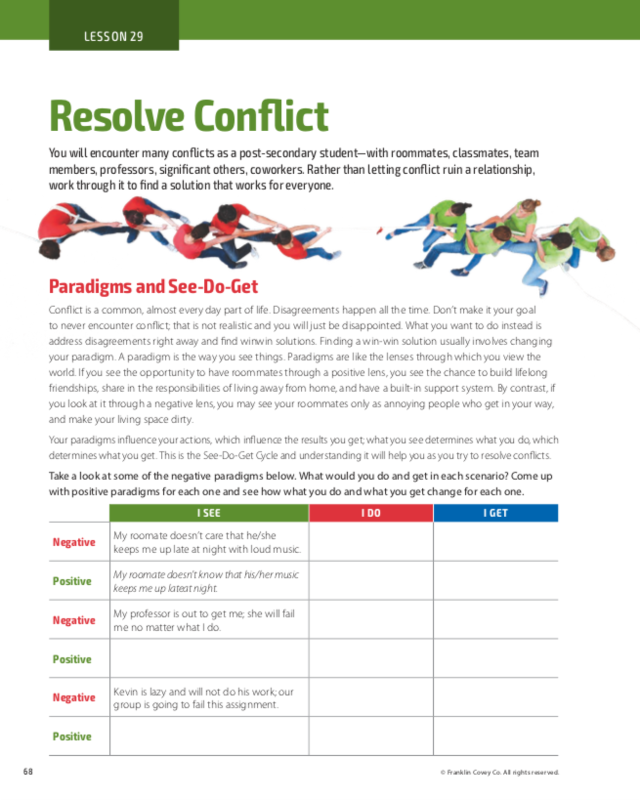 A staff member can certify school administrators and teachers to deliver this flexible course during advisory periods or throughout a full semester. 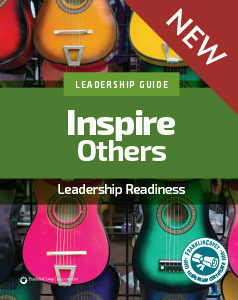 With a Leader in Me Annual Membership, schools can order printed course materials or access digital versions of the student leadership lessons through Leader in Me Online. Optional materials are available to provide additional learning opportunities with a 20-minute discussion format as well as a convenient 40-minute class model. However, in order to provide a rich, in-depth experience for students, a dedicated semester-long course is recommended. Before Leader in Me, we were noted for having the lowest scores in the region. Now we’ve had five years of consistent growth that’s outpacing the state growth on ACTs by at least 50 to 75%. Life experiences have prepared you for college. Discover the confidence to take the next step. College can seem intimidating, and there’s a lot to prepare for. But you’re more ready than you think. You’ve spent years inside a classroom, which have prepared you for the academic rigors of university instruction. You’ve worked, played, and performed alongside your peers and classmates, which has primed you for the getting into the social swing of college. 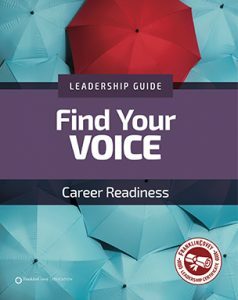 And you have had leadership opportunities— whether at school, work, home, in sports, or other extracurricular activities. 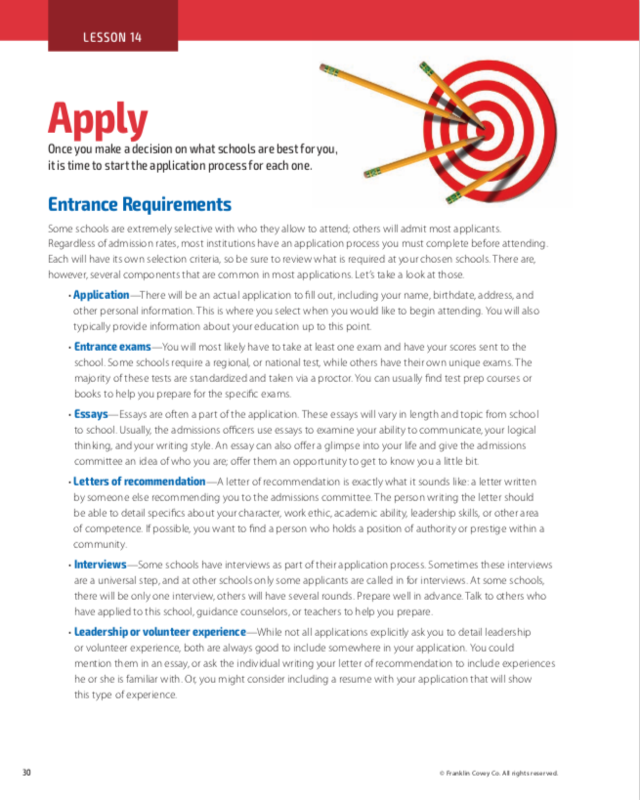 While your path to college is different from those of the people who sat next to you in math or played the saxophone behind you in band, your life experiences have prepared you for this next step. Now you’re ready to learn how to find the courage to take it. 1.) A compelling reason to go. If you have a compelling reason—a why—for advancing your education you’ll be more likely to finish your program. Meet Jaime Lopez, a student in Southern California, USA. Jaime grew up in a neighborhood where few students made it through high school. But despite a lack of role models, Jamie had a vision for his future that included getting a college degree. “I wanted something different for my life,” he said. Jaime saw college as the path to get him there. But Jamie had a long road ahead—he would be the first in his family to attend college, and without a sports scholarship or enlisting in the military, funding for his education was scarce. But despite these obstacles,Jaime refused to give up on his dream to one day become a college graduate. When Jamie turned 18, he left his hometown, got a job, and immediately began setting aside small amounts of every paycheck for tuition. After four years of saving, he enrolled in college. Today, Jaime is even more committed to graduating than he was after completing high school. His compelling why—to create and secure future filled with better-paying jobs and a life more fulfilling than those he witnessed growing up —keeps him working hard for his education. It’s just as important to know how to do well in college as it is to know why you want to go. 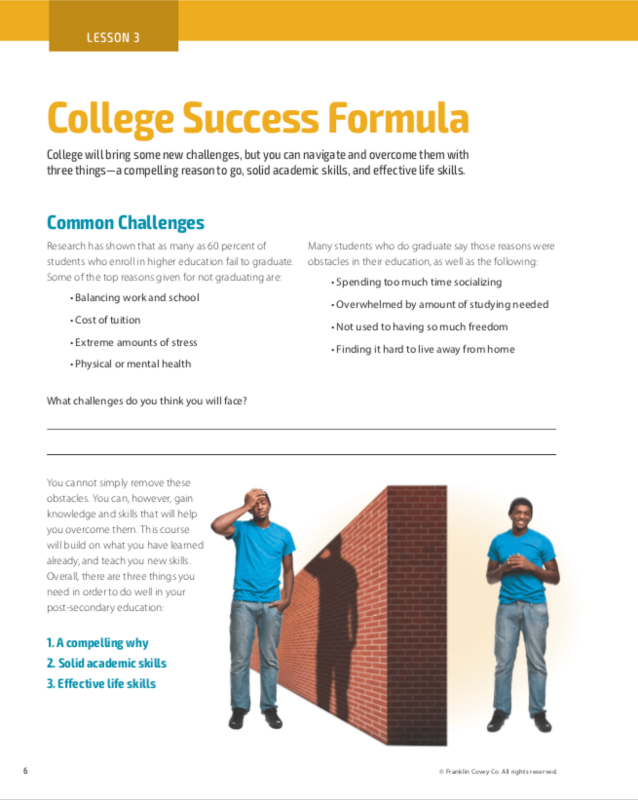 In order to succeed in a collegiate environment, solid academic skills are essential. Writing, reading, test taking, studying, note taking, critical thinking, researching, and presenting are all valuable skills that will enable you succeed in higher education, regardless of what you choose to study. You’ve done most (if not all) of this before, but you may need to learn, refine, or develop some of these skills. A portion of this course is dedicated to doing just that—learning new and improving old academic skills and adapting them to a post-secondary environment. You’ll spend the majority of your time outside of class time. 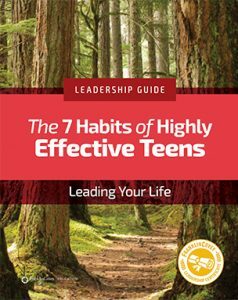 Developing basic life skills will help you keep priorities straight from your dorm room to the football field. College requires a lot more time management than you may be used to. 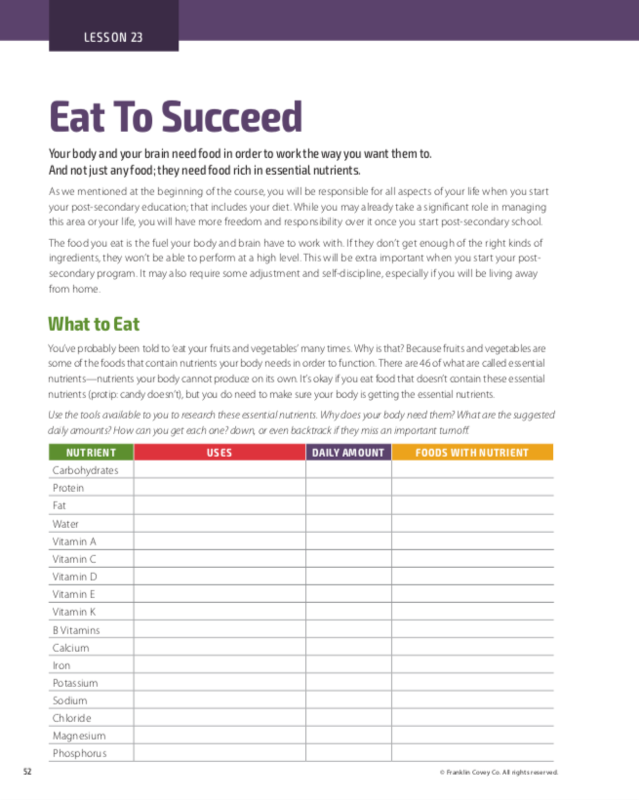 You’ll need to be able to set goals, communicate with others, manage your finances, resolve conflicts, build friendships, take care for your health, and much more. Just as with your academic skills, you have experience with a lot of these, but you’ll find university life brings with it new challenges. But don’t worry! This course helps you simply improve those skills you already have while helping you identify places where you may need to add a few more. 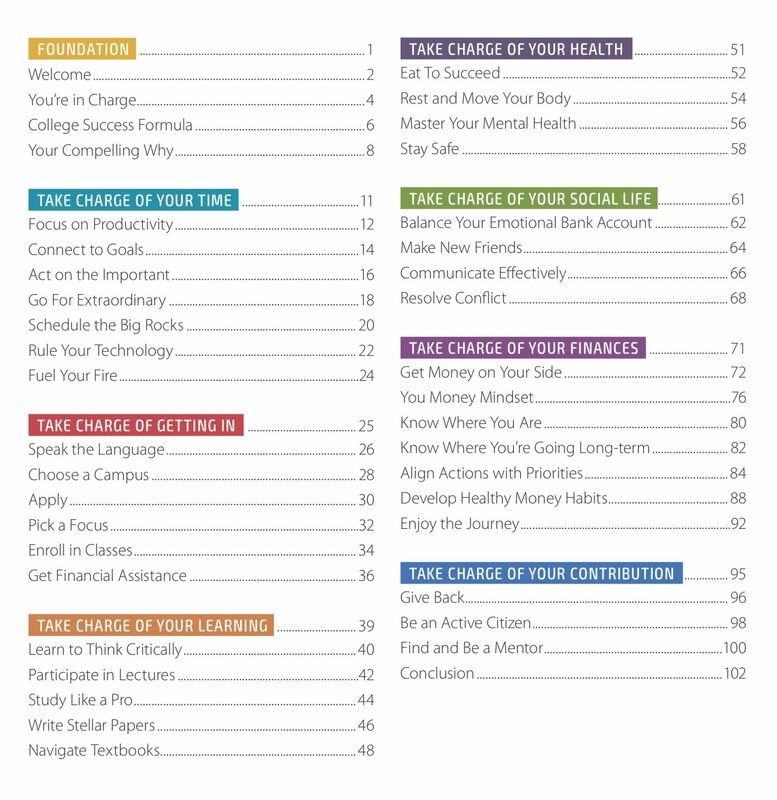 What you’ll learn from the 37 lessons found in the Take Charge College Readiness course. Use the certificate to add value to your résumé, college applications, and more! 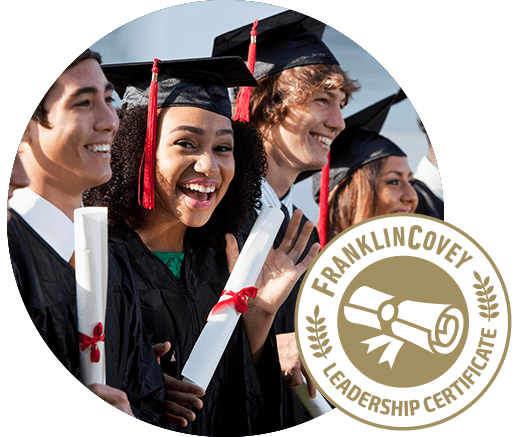 FranklinCovey leadership courses give students an opportunity to master college, career, and life-readiness skills. Flexible course options allow content to be delivered in a full semester or during advisory periods. Once students complete the series of courses, they can be awarded a leadership certificate to showcase on their résumé, college applications, and more.